Granite is beautiful and strong but you can make it last even longer by following the proper granite countertop care instructions. Your granite is not going to let you down so long as you don’t take it for granited! Granite countertops are an investment in your kitchen and your home, and just like any other investment you want to get as much out of them as possible. Here are 5 ways to ensure your granite remains beautiful for many years to come. 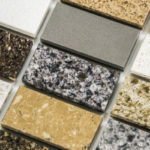 Long lasting granite countertops start with proper installation. 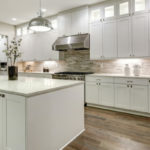 Hiring a professional with a sound track record to install your countertops is a wise decision that can save you so many issues down the road. Sealing your granite with the appropriate finish ensures a much longer lasting surface, and will also make your counters easier to clean. Since granite is naturally porous it is more susceptible to staining than people often assume. If your granite seems to be holding onto stains it may be a sign that you need to reapply a water-based sealant, or hire a professional to add a more advanced sealant. Some people suggest sealing your granite countertops annually but this is a little excessive. Instead you should only use sealants when granite absorbency tests indicate it is necessary. Applying sealers too often can create a number of issues, including a gross residue that won’t clean off countertop surfaces. Prior to adding a sealant granite must be prepped and buffed. In most cases the sealant is sprayed on and then allowed to sit and soak in. Once it has thoroughly penetrated the stone, according to package instructions, you will wipe dry with a soft cloth. In order to keep your granite shiny and pretty you need to regularly clean it. Even if surfaces don’t look dirty the beginning stages of dirt build up are there, don’t give them a chance to visibly surface. The quicker you clean up a spill the better, giving staining agents less opportunity to soak into your countertops. It’s not just stains you are trying to avoid but also surface scratches caused by a build up of debris. At least once a week use a soft sponge and water to clean all countertop surfaces from top to bottom. Post-wash use a soft lint-less or microfiber cloth to dry completely. From time to time use a pH neutral dish washing fluid and water to remove stuck on food and other particles. For those stubborn soap scum stains you need a specialty cleaner to do the job. Seek out a non-acidic stone cleaner. Wet your counters before directly applying the cleaner, then scrub in circular motions using a soft cloth. Wipe clean and then rinse to remove any left on cleaner. You may need to repeat the process a few times to get the results you are seeking. You may also use a razor scraper to remove soap scum. You want to be extra careful with this method. 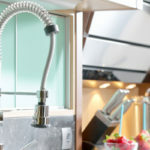 Wet your countertops first and make sure to only use the razor at a flat angle and do not apply pressure that will create cuts in your countertops. Once soap scum is removed wash counters and wipe dry. If you have textured granite countertops you can’t use a razor scraper, instead you should only use a non-acidic soap scum cleaner. If your granite becomes damaged by a crack or scratch you can fill in the area using epoxy or resin filler that matches your granite coloring. You should be able to easily locate this at any home improvement store. Prior to adding the filler you will need to sand the affected surface. Once the surface is dry you can return to using countertops as normal. If the crack or chip is larger than an ice cube it’s time to call in a professional to properly take care of it. 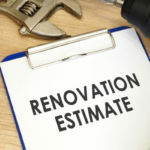 For heavily scratched granite countertops, or just to renew original shine to your granite, the entire surface can be buffed out with a handheld tool available to rent or buy. It is recommended that you hire a professional for this task. Clean up spills or any moisture right away. Regularly clean surfaces using warm water, mild soap and a soft cloth. Use coasters for drinks and hot pots. 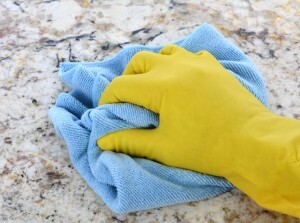 Use mild cleaners and treat granite as if it is more sensitive than it really is. Cut directly on granite surfaces. Leave moisture on countertops for prolonged periods (especially true with acidic drinks which eat away at the finish over time). Use cleaners with harsh chemicals as they can cause serious scarring damage in granite. Place hot pans directly on countertops, thermal shock can damage granite surfaces considerably. Use steel wool or anything rough like this to clean countertops, ever! Most important, you should never pay too much for your granite countertops! Buy high quality granite materials at wholesale cost from Tops Kitchen Cabinet.